Mary Kate and Ashley Olsen are two of the most well-known actresses in the business, also known as the Olsen twins. They got their big start on the hit show Full House when they were just toddlers. Now the 28 year olds have grown up significantly. They are both very beautiful and have won the hearts of millions of people, despite a couple of their bizarre incidents going into adulthood. Since we have watched these two grow up we have plenty of before and after pictures to look at through the years. One thing is very obvious; these two sisters had some cosmetic surgery done. When you see the photos you can tell that for the most part they had the same kind of surgeries done, which means they both still look like twins. Here is some of the work they got done per the photos. 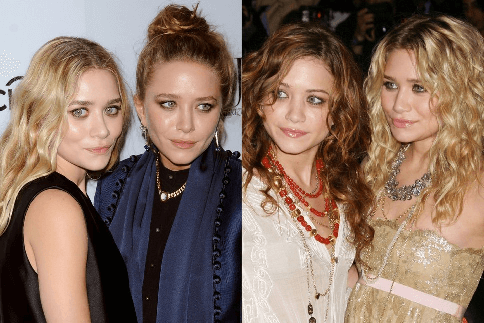 First of all you can tell that the Olsen twins had a chin job to change the way that their chins look. There are a couple of signs that point to this. First of all notice that they both have smaller, tighter chins than they did when they were younger. The reason they probably look this way is because they had chin jobs to slightly change the appearance so that they were happy with their new look. Getting work on your chin is something most celebrities do in their life, we can just never look far enough back to tell. The Olsen twins also seem to have had their fair share of Botox injections. When you look at their cheeks notice how tight and puffy they are. Most cheeks do not look this way. When someone get Botox injections a filler is put into the skin to smooth out wrinkles and fine lines. It does not matter how many surgeries they end up getting, everyone will love them just the same!